254 pp., trade pbk., $14.95. It seemed out of place, a mountain in the middle of nowhere. Jared started into the ravine. Kyle grabbed his arm and jerked him around. �I said, wait.� Kyle�s eyes were dark thunderclouds. �You can�t mean that hill.� He pointed with the rifle. The cover of Karen Bass� new novel, The Hill, immediately drew me to the book. It suggests something mysterious, sombre, and dangerous. The cover drew me in, but it was Bass� skillful writing that held me there. Bass wasted no time with a slow build-up. On the first page 15-year-old Jared Fredrickson finds himself in the crumpled remnants of a plane that has crashed into the fog-enshrouded forest depicted in the book cover image. Jared was flying from the Edmonton home he shares with his mother to visit his estranged father in Yellowknife. Fortunately, when the plane crashes in northern Alberta, Jared is discovered by Kyle Badger. Kyle is also 15-years-old. He is a Cree boy who lives in Wabasca, AB. With the pilot seriously injured and unable to help, Kyle manages to extract Jared from the wreckage. Jared discovers that he has no cellphone reception and so is unable to phone for help. He reasons that, if he leaves the crash site to climb to a nearby peak, he is likely to get reception. He is not only surprised, but also irritated, by Kyle�s insistence that they not climb the hill. What transpires after the boys eventually make the ascent is a well-written mix of contemporary realistic survival fiction interlaced with Cree legendary figures Wihtiko (a man-eating spirit being) and Wesakechak (a trickster figure). The two boys initially struggle to discern what is real and what is imaginary as they try to understand how the hill climb has cast them into a spirit world somewhere between the past and present. Yet Bass� writing is sufficiently adept that the reader is able to suspend disbelief and accept the possibility of what is portrayed. The writing in Bass� novel focusses as much on the journey for Kyle and Jared as people as it does about a journey in time and place to escape their predicament. The author does a fine job of depicting the development and maturation through experience that the boys undertake throughout the course of events. �Sometimes scared is the smartest thing you can be,� Kyle tells Jared on p. 29 and then, on page 87, �Sometimes afraid is the smartest thing you can be.� It is wise advice, and gradually Jared comes to appreciate Kyle�s wisdom. Jared recognises that in what becomes a struggle to stay alive, he has little to contribute. Despite feeling some form of a cultural obligation to help Jared as a stranger in need, Kyle resists what he believes is Jared�s ethnocentric arrogance. �Me not being white doesn�t make me your servant,� Kyle insists on page 30. �Being First Nations doesn�t mean I�m stupid,� he says on page 87. �You�re everything I don�t like about whites,� he tells Jared on page 99. �Don�t talk to me about my people. You have no idea�what it�s like to be treated like scum because of your skin color,� he complains on page 118. Eventually, however, Kyle starts to recognise Jared�s good qualities and value as a person and, as Jared notices, Kyle starts to treat him �almost like he was an equal.� As a measure of his new-found humility, however, Jared recognises the equal treatment and respect as a lie. In their wilderness surrounds, Jared begins to see himself as distinctly inferior. �Cree people, we work together for the good of the whole tribe. We work together to survive,� Kyle tells Jared as the two bond to become a tribe of two. The boys come from vastly different backgrounds, but, in their present predicament, they must come together in a bond of mutual respect and interdependence. In the promotional materials for the book, mention is made of the fact that the story was inspired by a real-life remote plane crash. It is, perhaps, important to note also that the Cree content was inspired and informed by Bass� Cree friends and neighbours. The blend of realism and mythology is a difficult mix to pull off, but Bass succeeds admirably. 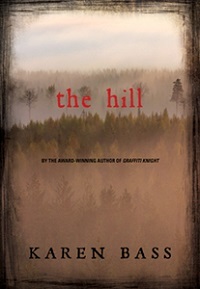 The Hill is an interesting and unique addition to the ever-expanding body of teenaged wilderness survival novels. This is a popular genre for writers and readers, but the added elements of Cree traditional beliefs and cross-cultural tensions help Bass establish her own niche within this field.